A special morning treat for you and your family. Add a sprinkle of granola for more crunch. Makes 4 servings. ½ ripe papaya per serving. Cut papayas in half lengthwise. Scoop out seeds. Place each half in a medium plate. 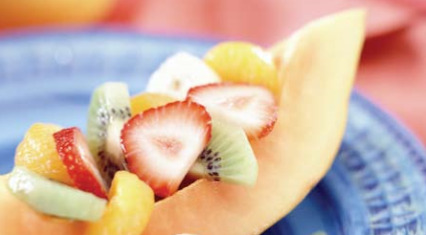 Place an equal amount of banana, kiwifruit, strawberries, and oranges in each papaya half. Combine yogurt, honey, and mint; mix well. Spoon over fruit before serving.